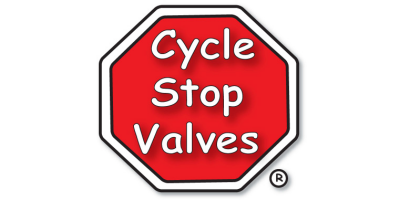 For use with water well pumps and booster pumps, the Cycle Stop Valve (CSV) turns any pump into a variable flow, constant pressure system. Working in conjunction with a small pressure tank, the CSV is usually adjusted to the middle of the pressure switch range. IE; 40/60 PSI switch, 50 PSI CSV. The size of the pressure tank determines how much water can be used by the system before the pressure drops to 40 PSI, and the pressure switch starts the pump. As long as flow rates demanded is not more than the pump can provide, the CSV maintains a constant 50 PSI on the system. When there is no more flow required for the house, the CSV allows the little pressure tank to fill at a reduced rate to 60 PSI, and the pump is shut off by the pressure switch.